2. Ashmead WH. 1904. Classification of the chalcid fliesof the superfamily Chalcidoidea, with descriptions of new species in theCarnegie Museum, collected in South America by Herbert H. Smith. Memoirs ofthe Carnegie Museum 1(4): I-xi, 225-551, 39 pls. 3. Bouček, Z. (1988) Australasian Chalcidoidea (Hymenoptera). A biosystematic revision ofgenera of fourteen families, with a reclassification of species. 832pp. CABInternational, Wallingford, Oxon, U. K., Cambrian News Ltd.; Aberystwyth,Wales. 4. Ferrière, C. (1941) New species of Euplectrini (Hym.Chalcidoidea) from Europe, Africa and Asia. Bulletin of EntomologicalResearch 32: 17-48. 6. Noyes J.S. 2002. Interactive Catalogue of WorldChalcidoidea (2001 - 2nd edition). CD-ROM. Taxapad, Vancourver and the NaturalHistory Museum, London. 7. Peck, O, Z Boucek, and A. Hoffer. 1964. Keys to theChalcidoidea of Czechoslovakia (Insecta: Hymenoptera). Memoirs of the Entomological Society of Canada 34. 125 pp. 8. WijesekaraGAW & Schauff ME. 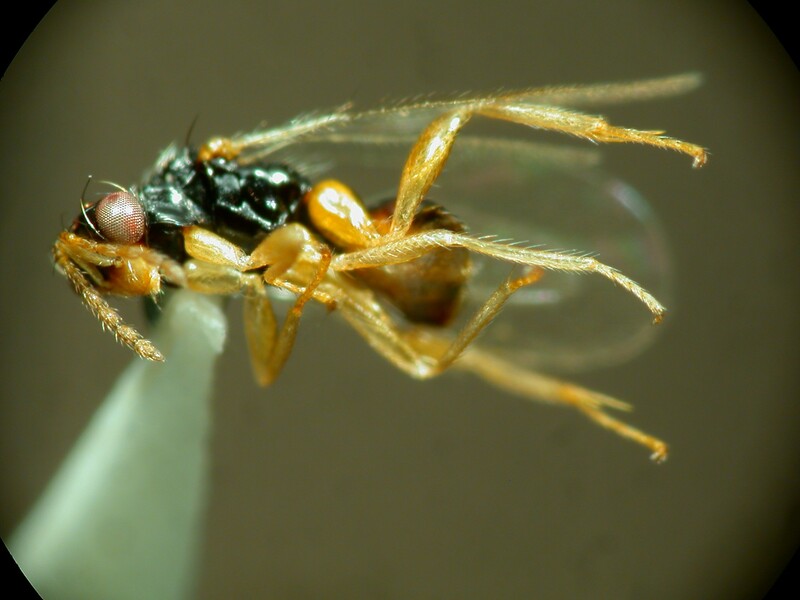 (1994) Revision of the tribe Euplectrini of Sri Lanka(Hymenoptera: Eulophidae). Oriental Insects 28: 1-48. 9. Wijesekara GAW & Schauff ME 1997. Two new generaand three new species of Euplectrini (Hymenoptera: Eulophidae) from the NewWorld. Proceedings of Entomological Society of Washington 99(1):101-109. 10. Zhu, CD & DW Huang 2001a. Revision of Chinese EuplectromorphaGirault (Hymenoptera: Eulophidae) and two new species from outside of China. Insect Systematics and Evolution. 31: 401-410. 11. Zhu, CD & DW Huang 2001b. A Study of Chinese ElachertusSpinola (Hymenoptera: Eulophidae). Zoological Studies. 40(4): 317-354. 12. Zhu, CD & DW Huang 2002a. Platyplectrusmedius, new species, and new records of Euplectrus from South Korea (Insecta: Hymenoptera: Eulophidae). The Raffles Bulletin of Zoology. 50(1): 129-136. 13. Zhu, CD & DW Huang 2002b. A study of Chinese Cirrospilus Westwood (Hymenoptera:Eulophidae). Zoological Studies. 41(1):23-46. 14. Zhu, CD & DW Huang. 2003. A Study of the Genus Euplectrus Westwood(Hymenoptera: Eulophidae) in China. Zoological Studies. 42(1): 140-164. 15. Zhu, CD & DW Huang.2004. A study of Platyplectrus Ferrière (Hymenoptera: Eulophidae) in Mainland China. Journalof Natural History. 38(17): 2183-2209.